That’ll Be The Day certainly has a strong opening – we begin at David Callan’s funeral. The mourners include Hunter, Bishop, Colonel Leslie, Cross and a clearly distraught Liz. A late arrival is Lonely, who comes complete with an impressive floral display (which he’s naturally pinched). One of the few moments of levity in the episode occurs when a disbelieving Lonely hears the vicar’s fulsome tribute. He describes Callan as a humble man of peace – a far cry from the person that Lonely knew. So Lonely comes to the conclusion that they’re burying the wrong man! Arresting as this is, it’s not very logical. If Callan had been a public figure (a politician, say, or a civil servant) it would have made sense to stage a mock funeral. But as he’s not, the only thing the funeral does is to make Lonely convinced that Callan isn’t dead after all. In Mitchell’s original draft script, Callan and his Russian counterpart (originally called Lonsdale, later renamed Richmond) were apprehended at the same time – both sides then agree on a publicity blackout so they could be exchanged. This makes the reason for the mock funeral slightly more plausible, but it’s still a problem. Also present at the funeral in Mitchell’s draft script was Toby Meres. He didn’t feature in the final program, but he is mentioned (and will return later in the series). Somebody who does make an appearance is a previous Hunter, Colonel Leslie (Ronald Radd). Since he doesn’t speak a word, for anybody not familiar with the first two series he could be taken for just another extra. But for those who’ve seen the black and white episodes it’s a lovely touch. Callan isn’t dead of course, he’s a prisoner of the Russians and currently undergoing interrogation at the Lubyanka. The first time I saw this episode I assumed it was the second part of an existing story – mainly because of the cold open. We’re told that Callan was on assignment in East Germany, that the girl he was with was killed and that he was then taken to the Lubyanka. It’s very jarring that this is all tell, not show. A modern series would have no doubt set this plot-line up at the end of the previous series, closing on a cliffhanger of Callan’s abduction. He’s clearly in a bad way – his head is shaven and he’s been pumped full of drugs. In many ways he’s in a similar state to how he appeared in Death of a Hunter, although it’s true that here he’s more aware of what’s happening – in Death of a Hunter his moments of lucidity were few and far between. 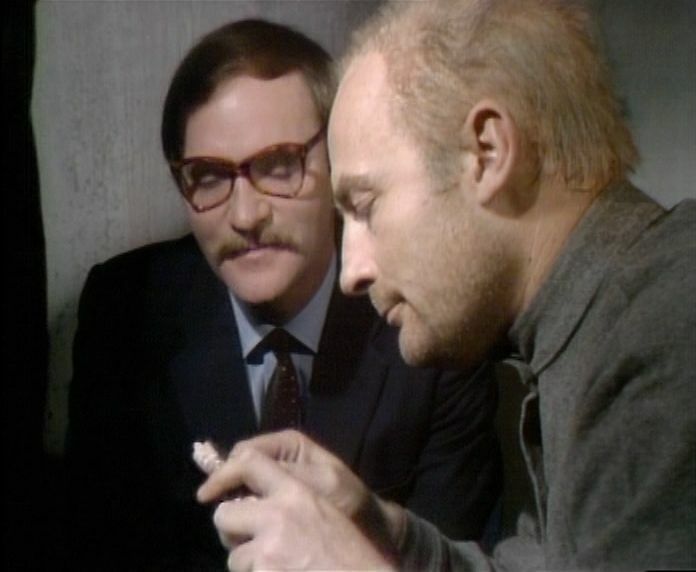 Karsky (Julian Glover) is given the task of interrogating Callan. Just as Callan has his counterpoint in Richmond, Karsky has an obvious opposite number in Snell (Clifford Rose). Whilst Karsky is using drugs to interrogate Callan, Snell is doing the same to Richmond. And Karsky and Snell are very similar character types – neither are cackling villains, instead they view their subjects with detachment and, especially in Karsky’s case, seeming compassion. Karsky knows that Callan will eventually tell them everything – the drugs will ensure that. But if Callan cooperates then the drugs won’t destroy him. So why fight? Naturally Callan replies in the negative, but it doesn’t shake Karsky’s composure at all. As might be expected, Julian Glover is excellent in these scenes, as is Woodward, and these two-handed moments are the highlight of the episode. T.P, McKenna’s Richmond is an interesting character. At this point he seems to have been created simply to solve the problem about how to extract Callan from the clutches of the Russians. But he makes an unexpected return towards the end of the series in several key episodes. He doesn’t have a great deal of screen-time here, but he still manages to make an impression. Another indication that Callan and Richmond are two sides of the same coin is demonstrated when it’s decided to exchange them (much to Hunter’s displeasure – he considers swapping Richmond for Callan is a bad bargain). Both Callan and Richmond are holed up in adjoining hotel rooms in Helskini – and they each offer their handlers a drink (which are refused). Callan’s miraculous return from the dead comes as a shock to some, especially Cross. You get the sense that he’s just started to enjoy being the top man in the Section and now that’s cruelly taken away from him. Patrick Mower would leave the series after episode five, so Cross only has a limited character arc in series four, but it’s still quite effective. In series three, Cross was several rungs below Callan – the older man was quicker, sharper and always more capable. He’s maybe slightly closer in ability now, but he also possesses character flaws which will prove to be his undoing. He’s always had a certain sadistic attitude – witness how he plays Russian Roulette with Lonely (admittedly with blanks) – and over the course of the next few episodes we’ll see how he gradually steps further and further over the mark. Hunter’s meeting with Callan is a rather frosty affair. He admits that if it was his choice he wouldn’t have had him back. But Callan is back and since Richmond was a top man it’s a matter of prestige for the Section that they can’t be seen to have swapped him for a lesser prize. But how can they prove to the Russians that Callan is Richmond’s equal? Promotion is the obvious course …..